ST. JOHN’S, NL, July 24, 2015 /CNW/ – Clearwater Seafoods welcomes the Belle Carnell into their fleet of clam vessels this afternoon at an official ceremony on the St. John’s Harbour Front. 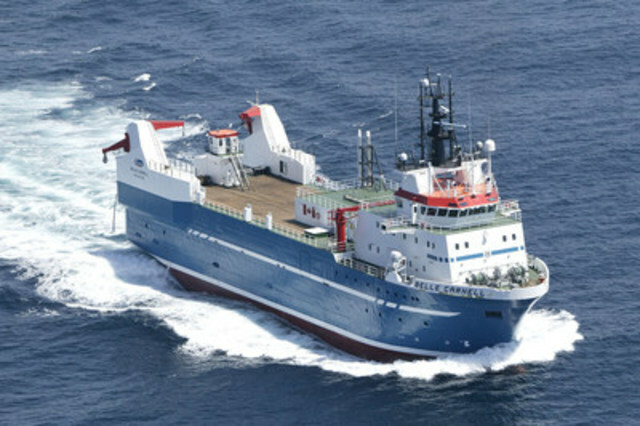 This state-of-the-art vessel further strengthens Clearwater’s commitment to delivering the highest quality, frozen-at-sea, wild-caught seafood to customers around the world. Named after Clearwater Co-founder and Chairman Colin MacDonald’s late mother, a registered nurse and proud Newfoundlander, the Belle Carnell will harvest Arctic Surf Clams, Cockle Clams and Propeller Clams year-round primarily in the Grand Banks area. The vessel measures an impressive 73.4 metres in length and is equipped with state-of-the-art navigational and sonar technology. The clams harvested by the Belle Carnell and her crew will be automatically shucked and individually quick frozen within an hour of catch using the vessel’s proprietary and advanced harvesting and processing technologies. Products will be sold almost exclusively into international, high-value sushi and sashimi markets, greatly expanding both Clearwater and Canada’s seafood exports to the U.S., Asian and European markets. Key markets where we expect to benefit from the Canadian Government’s ongoing initiatives to expand free trade, including the recently enacted Korean Free Trade Agreement, the soon-to-be-ratified Comprehensive European Trade Agreement (CETA) and the Trans-Pacific Partnership (TPP). Clearwater Seafoods (TSX:CLR) is one of North America’s largest vertically-integrated seafood companies with over 1,400 employees in our offices, plants and vessel operations in Nova Scotia, Newfoundland & Labrador and around the world. Clearwater operates from ‘ocean to plate,’ owning its own fishing quotas, vessels and processing facilities, while also providing reliable year-round delivery to its customers worldwide. It’s recognized globally for its wild-caught and premium-quality scallops, lobster, clams, cold water shrimp and crab. Since its founding in 1976, Clearwater has invested in its resource ownership, technology, conservation research and management to sustain and grow its wild seafood resource. This commitment has established Clearwater as a global leader in sustainable seafood excellence.